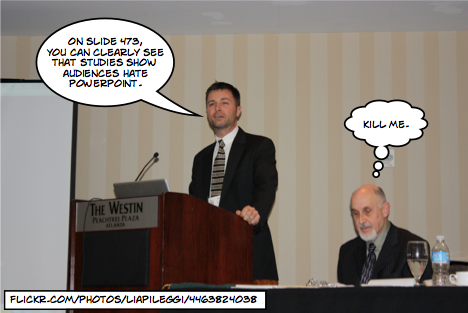 Surely Presentations Are More than Just a PowerPoint? In the last few weeks, many of my students have been grappling with the creation of digital products. Even though I more often than not leave the decision up to them as to what medium they choose to use, too often they arrive at the same conclusion - Microsoft PowerPoint. Now I am not saying that using PowerPoint is wrong, I just question the why it is always the first choice. This wondering got me thinking about how we have arrived at such a situation. My feeling is that the students are often rushed in regards to choosing the medium for their presentsations and given little scope or encouragement to branch out. I love +Michelle Meracis' phrase 'student voice, student choice'. Yet for too many, in sticking with PowerPoint, this supposed choice is reduced to 'images and text' as +Corrie Barclay warns. I think that this perceived lack of choice is sometimes brought about by teachers who themselves feel uncomfortable about offering different options and only model one way. I was really encouraged by a recent post from Barclay '1 iPad, 1 Task, 15 Ways'. In it he outlined what he saw as some of the options available for a particular assignment his students were completing. The reality is that there are always alternatives, I guess the challenge is being aware of them. Initially built for the iPad, but now accessible in the browser, Haiku Deck allows you to create highly visual presentations by quickly access Creative Commons images. Sadly, the appropriate use of images is too often overlooked in and out of the classroom in my opinion as for many it involves too much effort. Anything then that simplifies this process is only a good thing. An online platform, Powtoon allows you to create catchy animated videos with ease. With a wide range of images and icons, it often dragging items into the slide and then deciding how things will appear and for how long. In addition to this, there are a wide range of templates you can use as a starting point. A free iPad app that Dale Pearce put me onto, Adobe Voice is both easy and effective. Like Haiku Deck, it provides access to a wide range of Creative Commons images and icons, as well as an array of themes. What makes it different though is that, like Microsoft Photo Story 3 for Windows, it provides a means for easily narrating various slides. The only issue I have is that the videos are housed within Adobe's storage system, which can be a bit cumbersome. Although as I have suggested elsewhere that it takes more than an app to make a good presentation, the medium does at least have a part to play. So what presentation tool are you using or should I just give up the ghost and learn to love PowerPoint? What the Twitter Are You On About?